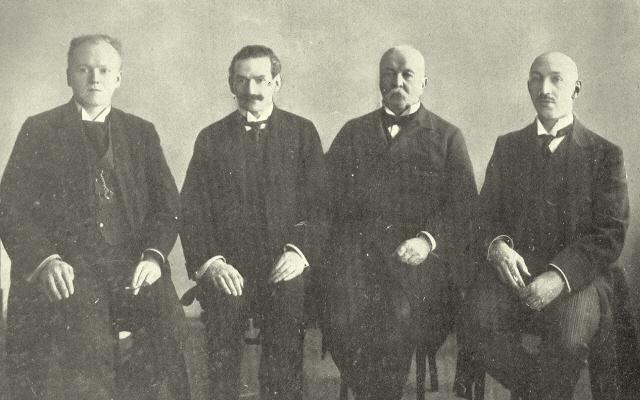 The great St Petersburg tournaments of 1895-96, 1909 and 1914 would hardly have existed without two of chess history’s outstanding organizers and patrons, Peter Alexandrovich Saburov and his son, Peter Petrovich Saburov, but how many people today would even recognize their names? The present item expands upon our research into the Saburovs published in Chess Notes in 1983. As regards P.A.S. (1835-1918), C.N. 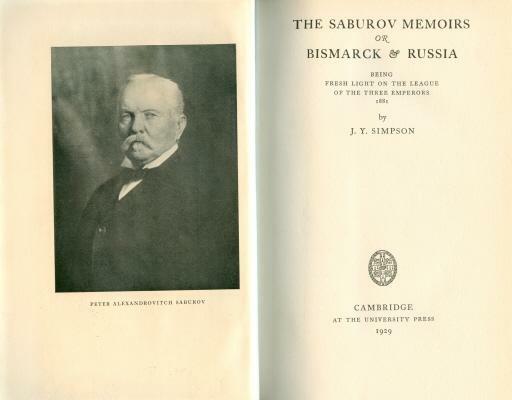 492 warmly recommended The Saburov Memoirs or Bismarck & Russia by J.Y. Simpson (Cambridge, 1929), a work which acknowledged assistance from P.P.S. but was mainly a translation of Ma Mission à Berlin 1879-1884 by P.A.S. himself. The book traced his remarkable career. 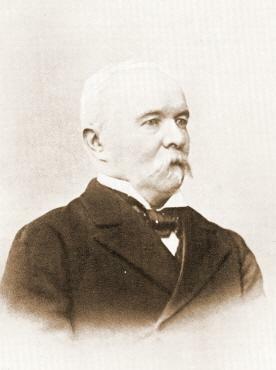 He was born on 22 March/3 April 1835 on the estate of Veryaevo in the district of Elatma in the Government of Taboff. His brother Andrew held for several years the portfolio of the Minister of Public Instruction. P.A.S. went to the Imperial Alexander Lyceum, St Petersburg until 1854, gaining a first gold medal. After employment in the Chancellery from 1857 to 1859, he worked in Munich, and then in England, where he stayed for 11 years, meeting the leading British statesmen. In 1870 he went to Carlsruhe, and subsequently moved on to Athens, where he stayed until 1879. In the summer of 1879 he was to be found in Constantinople, in which city he was appointed Russian Ambassador, although he never entered upon the duties. Then he did a four-year stint in Berlin (1880-1884), after which he left the diplomatic service. During the last decade of the century he became well known as a financial and economic expert. He listed his pastimes as pomiculture, architecture, the piano and chess. His eldest son died at the hands of peasants. After the revolution, in March 1917, P.A.S., as a senator, was appointed to a commission associated with the Senate, but was dismissed upon the accession of the Bolsheviks. Following a short illness he died on 28 March/10 April 1918 in Petrograd. It would be impossible to summarize here his diplomatic dealings with Bismarck and other prominent figures of the time, but J.Y. Simpson’s book provides fascinatingly detailed reading on the subject. 1 e4 e5 2 Nf3 Nc6 3 Bb5 a6 4 Ba4 d6 5 c3 Bd7 6 d4 Nf6 7 d5 Nb8 8 Bc2 Be7 9 Be3 0–0 10 Nbd2 Ne8 11 h3 f5 12 exf5 Bxf5 13 Bxf5 Rxf5 14 Qc2 Rf8 15 Ne4 h6 16 h4 Qd7 17 Ng3 Bf6 18 Ng5 hxg5 19 hxg5 Kf7 20 Nf5 Bd8 21 g6+ Kg8 22 g4 Nf6 23 f3 Nxd5 24 Qh2 Resigns. P.P. 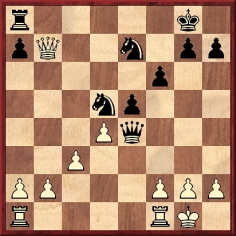 Saburov (Black) drew as follows: 1…Re8 2 c4 Nc3 3 d5 Ne2+ 4 Kh1 Qh4 5 d6 Nf5 6 d7 Nfg3+ 7 fxg3 Nxg3+ 8 Kg1 Ne2+. Source: La Stratégie, 17 March 1905, page 92. 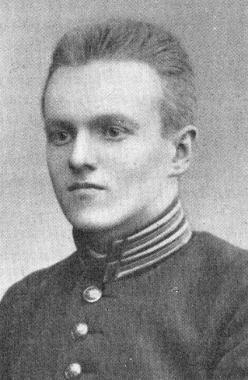 ‘Peter Petrovich Saburov, President of the far-famed St Petersburg Chess Club and Vice-President for Russia of the New York International Chess Congress [i.e. the major tournament planned for January 1912 but subsequently abandoned], was born in St Petersburg on 2 (14) January 1880. At the age of 20 he had completed his course at the Imperial Alexander Lyceum. Three years, 1901-04, were spent in the Ministry of Foreign Affairs, and the next two in the office of the chancellor of state. The title of Gentleman of the Chamber at the court of H.I.M., the Emperor of Russia, was bestowed upon him in 1905. A year later, he retired from the state service with the title of Collegiate Assessor. At this writing, Mr Saburov is studying musical composition at the St Petersburg Conservatory, which he entered in 1909. The father of Mr Saburov, His Excellency P.A. 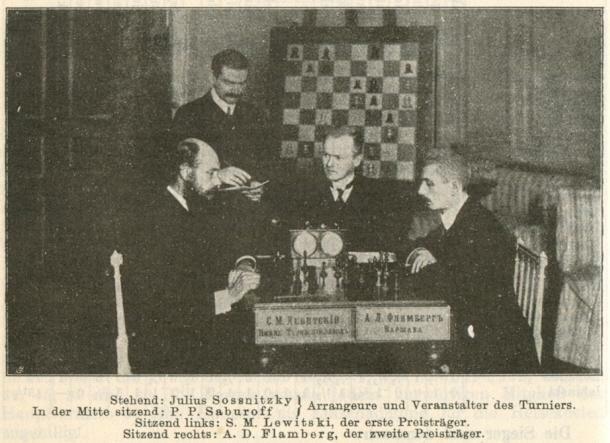 Saburov, now an honorary President of the St Petersburg Chess Club, himself a strong amateur, has in his day done much for the chess life at the capital, having been instrumental in the arrangement of the Lasker-Steinitz-Pillsbury-Chigorin tournament of 1895-96. His wife, a niece of the late Woldemar Graf Vitzthum von Eckstädt, well known as a German expert, taught the son to play chess when he was 16. The subject of this sketch has attained the strength of a player of the second class, his chief success having been first prize in a tombola tournament at St Petersburg in June, 1903. But it is not as a player so much as an organizer that he has made his mark. 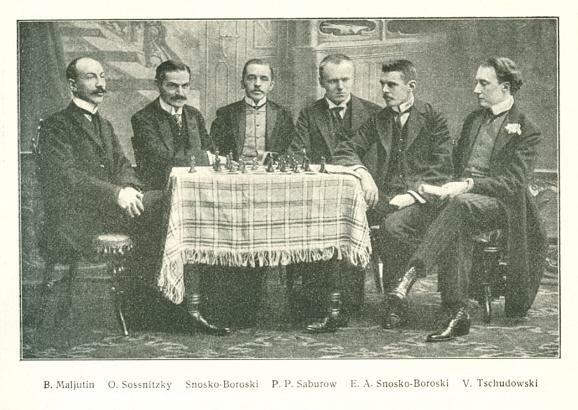 During the season of 1902-03 there were fortnightly chess matinees at his home, which were frequented by such experts as Chigorin, Schiffers, Lewin and E. Znosko-Borovsky. About that time, Sergius Znosko-Borovsky, older brother of the master and whose death on 10 August has just been reported, formed a small private society of chess amateurs. 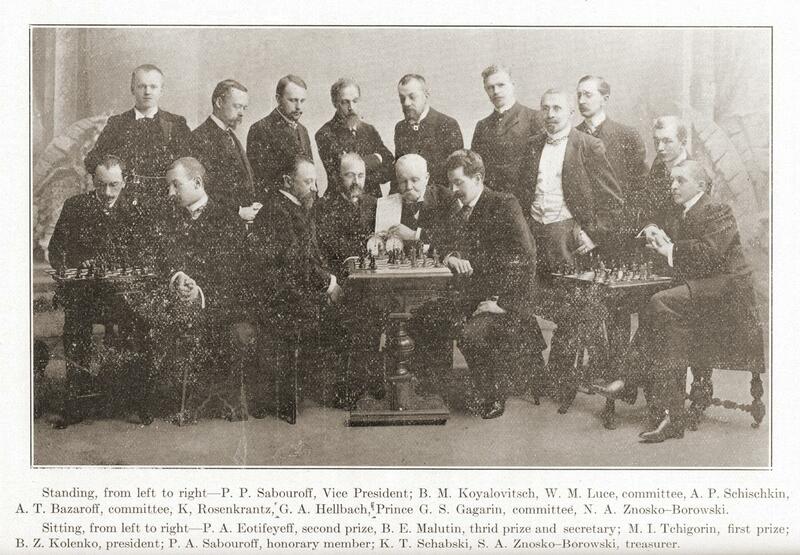 When, in 1904, this coterie was transformed into the St Petersburg Chess Club, P.P. Saburov was elected Vice-President, holding that office until 1908, when he was elected President. Next year, he retired from the committee, but resumed his activities in 1910 as chief manager of the tournaments. This year, he was again elected to the Presidency. Having settled in Switzerland, P.P.S. all but vanished from chess literature. One of his rare re-appearances was on page 371 of the October 1923 BCM, which referred to a letter he had written to the magazine correcting a reference to Schiffers, Schlechter and Zukertort having been Jews. Under the heading ‘A Letter from Switzerland’, page 189 of the December 1930 American Chess Bulletin published a brief text from ‘Peter P. Saburov, Former President of the Committee of the Pan-Russian Chess Society and former President of the Committee of the St Petersburg Chess Assembly’ in which he rather lamely listed the leading players he wished to see invited to a proposed double-round tournament in the USA. ‘Chess and Music. – P.P. Saburov, who was once president of the Pan-Russian Chess Federation, and also of the Petrograd Chess Club, has composed a Love Symphony for big orchestra, which was played for the first time on 6 May in the “Concert Classique” at Monte Carlo and proved a great success. P.P.S died in Switzerland in 1932 – in March of that year according to the inaccurate obituary on pages 139-140 of the May 1932 Deutsche Schachzeitung. In 1983 we examined the local newspapers (e.g. the Tribune de Genève of 24 February, 25 February and 28-29 February 1932) and learned that on 24 February ‘Pierre [de] Sabouroff’ was discovered lying on the floor of his home (6 rue du Collège, Carouge) after suffering a cerebral haemorrhage. He died at the Hôpital cantonal in Geneva on 26 February 1932 (and not, as we incorrectly wrote in C.N. 448, in Carouge). The newspapers described him as a musician (‘cet artiste, dont les oeuvres et les connaissances d’historien de la musique sont si appréciées à Genève et à l’étranger’) who gave private lessons on the history of music. No mention of chess has been found in any of the newspaper reports of his demise. Source: American Chess Bulletin, May 1906, page 88. The occasion was the St Petersburg Chess Club Rice Gambit Tourney. Latest update: 24 July 2011.